No matter your diagnosis, cancer can leave you feeling isolated. The following support groups can help you find a community, either in person or online. Remember, whatever you’re going through, someone else has already come out the other side. Cancer and Careers provides advice and educational events to help cancer patients and survivors navigate the workplace. Visit the site for regional events and resources. CancerCare is a national organization that provides counseling, support groups, workshops, publications and financial assistance to anyone affected by cancer. Visit the site for more information. Cancer Support Community offers social and emotional assistance to cancer patients anywhere in the world. 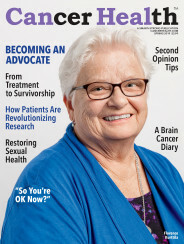 CSC’s Cancer Policy Institute focuses on patient advocacy. Visit the site to find an affiliate group. Friend for Life is an international network of cancer survivors and caregivers who provide one-on-one emotional and psychosocial support to people recently diagnosed with cancer, as well as their loved ones. Visit the site to be matched with a volunteer. Latinas Contra Cancer’s mission is to support Latinas who are living with or have survived cancer and to promote cancer awareness in the Latino community. Visit the site for international resources. Malecare is a leading support and advocacy organization for all men living with cancer, especially prostate cancer. Information is offered in multiple languages. Visit the site to find a support group near you. The National LGBT Cancer Network provides support to members of the LGBT community who are living with or have survived cancer and offers cancer education to the LGBT community. Visit the site to join its online support groups. Nueva Vida offers information, support and empowerment for Latino families, both cancer patients and those affected by cancer. Visit the site for services, locations and partners. Sharsheret serves Jewish women living with breast cancer or ovarian cancer or who are at increased genetic risk for breast cancer. Visit the site to find a chapter near you. Sisters Network offers support to breast cancer survivors, with a focus on African-American women, as well as community outreach and education. Visit the site to find a support group near you. Stupid Cancer offers guidance, support and empowerment to young adults (under age 40) affected by cancer. Visit the site to find online resources, meet-ups and a regional chapter near you.